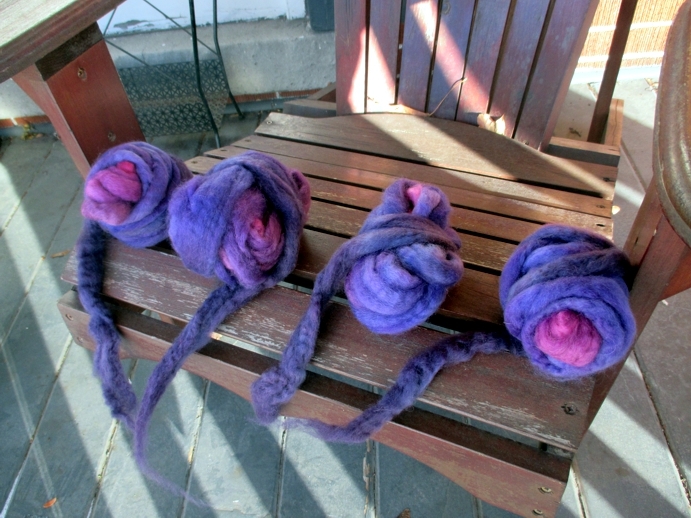 Apparently in a previous Twisted Fiber Art club signup I asked for three different rovings dyed in an evolution - which is to say, a colour that slowly shifts from A to B to C, rather than in a perky A-B-C, A-B-C, A-B-C sequence or some other variation. 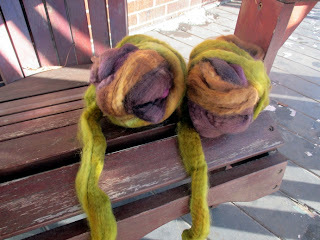 I am pretty sure I did this 'for a change', and perhaps even to make myself knit different things. But the fact is, evolutions are a very specific sort of material. You can't, for example, with just one skein knit something in a pair that is going to come out perfectly symmetrical - because you will have A and a bit of B for one of them, and some more B plus some C on the other. If you are a symmetrical person (hi again!) this will drive you absolutely bats. And that means that an evolution will force you to make singleton projects - hats or cowls or, most often, shawls. 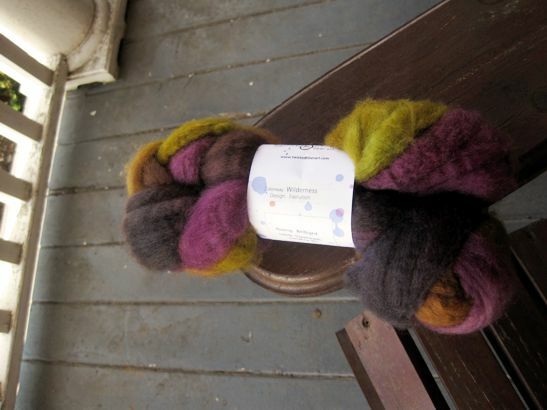 Shawls from evolution-dyed yarns are hugely popular and so, so pretty. Which is nice, but I don't wear shawls. I mean, I have lots. I've designed several and knit other people's designs and I love them, truly, but they aren't me and even worn as scarves, they just don't work for me... probably because I keep knitting in colours I'm not wearing the day I reach for those shawl-scarves. And all that explains why all three braids have been lurking in my stash cupboard. This cute colourway drifts through purples and blues and pinks, and it is promising me to work well as fingerless gloves provided I've divided it evenly for a shot at two small skeins of matching evolutions. I'll aim for sport weight and hope for the best. This one is called Wilderness and I can't for the life of me think why I didn't order more of this in yarn at the end of that club because WOW. I divided the braid into two and I'm going to go for bulky with a gorgeous autumn-friendly cowl in mind. Or... maybe another handspun hat. This one is Velvet, and I can only assume that my love for Wilderness was temporarily hijacked by Velvet because I have a lot of it in my stash. Without thinking, I bought two skeins of it in a DK weight yarn plus the Apricot contrast, and two more skeins of it in a sport weight plus the Apricot contrast, as well as the original braid, and that is just crazypants. Also that is a lot of yarn. I made a hat, a cowl, and a woven scarf, and that's just with the DK... and I still have a little more of that, without touching the stuff in Playful. Gah! 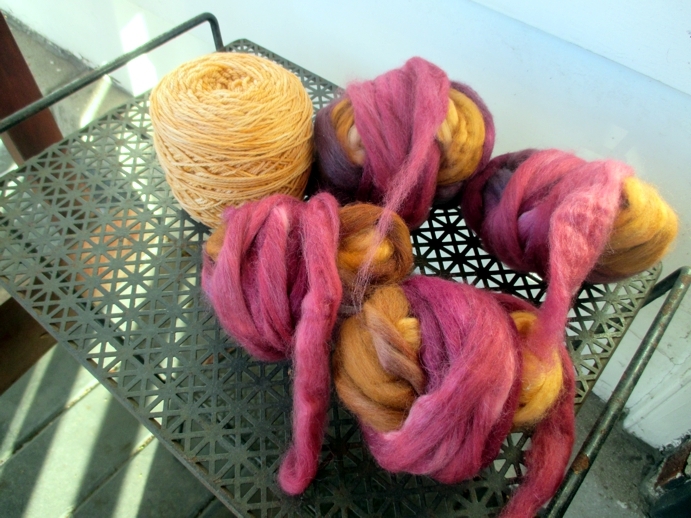 So the plan here is to spin the roving into a sport weight evolution - one of them from A to C, the other from C to A, and then weave a scarf with the Apricot non-handspun yarn serving as the very stable contrast. Ideally, the Cs will meet in the middle and I will look like a genius. Hey, it could happen, right? But you know what will happen for sure: me being back here again on Monday. Hope I see you then and in the meantime, have a great weekend! I love hearing about your stash! It makes me feel a little less "hoardy". But it also makes me want to buy more yarn and roving. Oh dear... that means I'm more hoardy, doesn't it... and also I just bought more yarn yesterday. GAH. must. knit. stash. I was thinking of striped chevrons all the way to the end of your post when you mentioned weaving! Use them together, they will be perfect! I'm a long time reader, first time commenter. Sorry to just lurk about your life! Ohhh, do you mean all four of the different colourways together in one scarfy thing? They do all have purples... that is a VERY interesting idea. h'mmmm.